Inspired by DrifterMan and GelTAZ I wanted to take on a new interloper challenge. How long can one survive in FM only on interloper? GelTAZ recorded a nice video series about surviving until the train cleared the tunnel on day 7 (see link below). Sadly GelTAZ did not catch his train. Survival in the muskeg is a brutal existence. Constant exposure, only one load screen, limited loot and matches and a single solitary place to sleep each and every night. So, welcome home to Old Spence Family Homestead. We will get pretty familiar with this place. I'll open up the question to everyone here - how long is is possible? What are the priorities? What are the distractions? After a few random starts in PV and TWM I finally got my first FM start on this quest. This is it, I will not leave this map. I will die here. Start in the clearing above the train close to BR. It's dawn and blowing hard. Collect sticks and mushrooms. I've gotta find some matches and we know where to get them. One wolf at the broken tower, he's facing away from me and I get around without attracting attention. I already have hypo and frostbite x2. 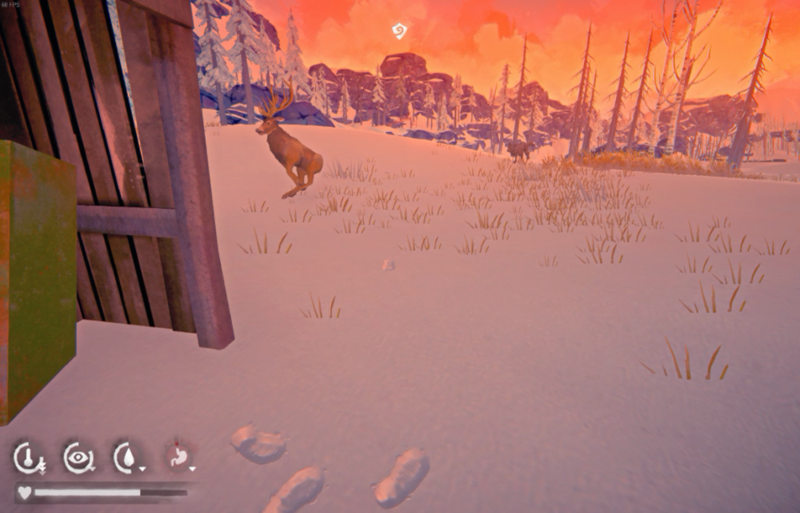 3 deer at Spence's, a crowbar on the toolbox (random? ), down vest 40%, work gloves 61% on the workbench (the irony) and of course what I came for - 12 precious matches. Go to the forge - no tinder! I find a book, no time to read this, it will give me 75% chance rather than 60% with sticks. I break down one stick for tinder as my condition drains. I estimate around 65% condition from my short walk in. Frostbite 48% and 78% - at least we found gloves. Prep some reishi and make some tea. Collecting more wood from around the barn and what do I hear behind me. It's the low grunt of a deer death. I rise over as knob to see the most fortunate kill one will ever happen on. 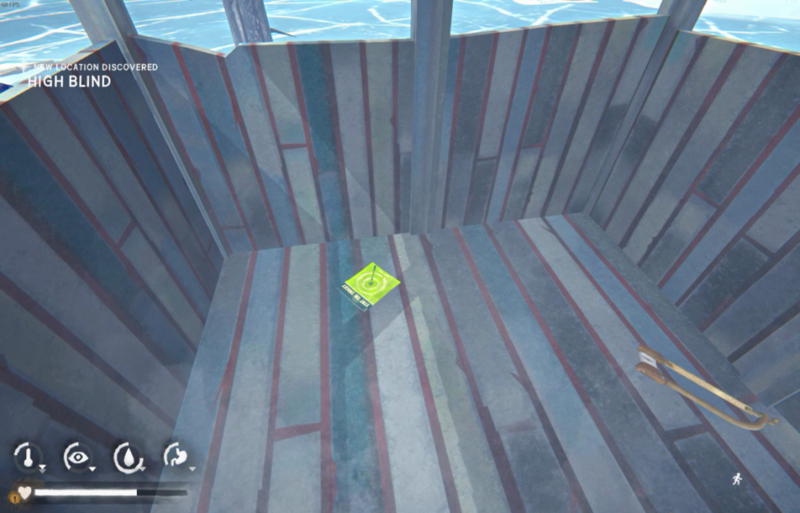 I think I didn't survive the first night in my last attempts at Bareskins Skaters... Wish you all the luck you need! Waiting with great anticipation for the next instalment. 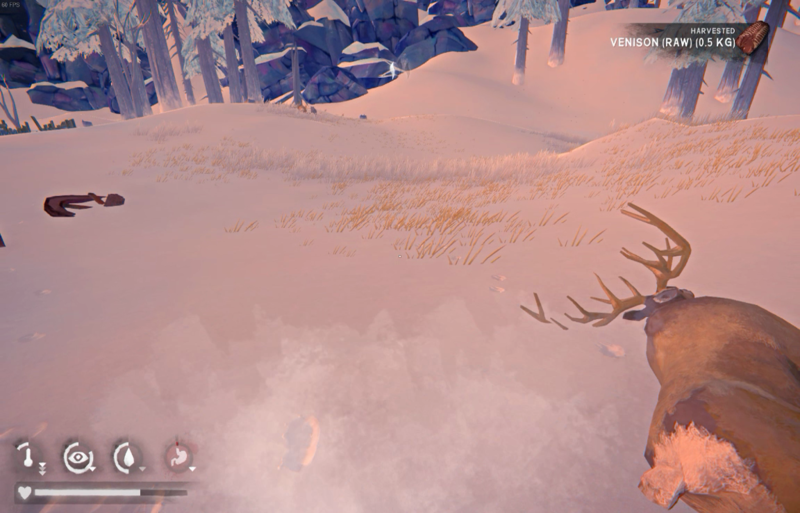 Were you able to get Sir Wolf separated from his kill without injury? I never went as far as that in a Skater run, they have all been pitiful... 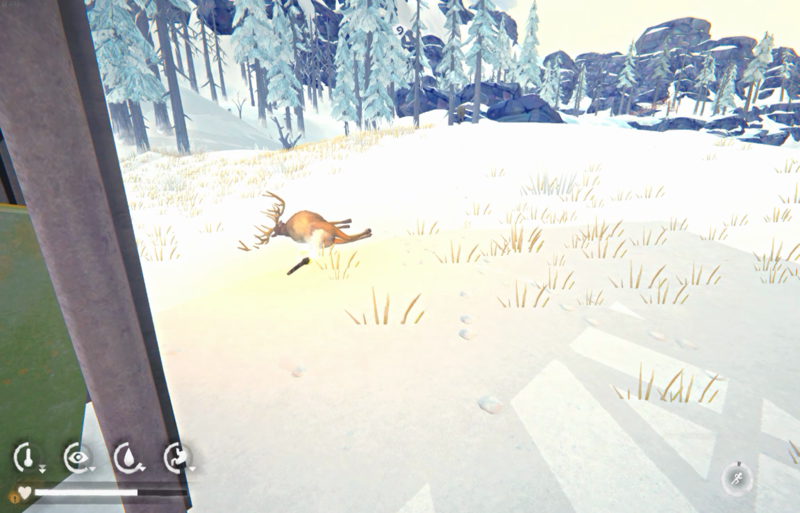 I even manage to die from a fall (my only time), avoiding a bear. Forlorn Muskeg is my real nemesis zone... 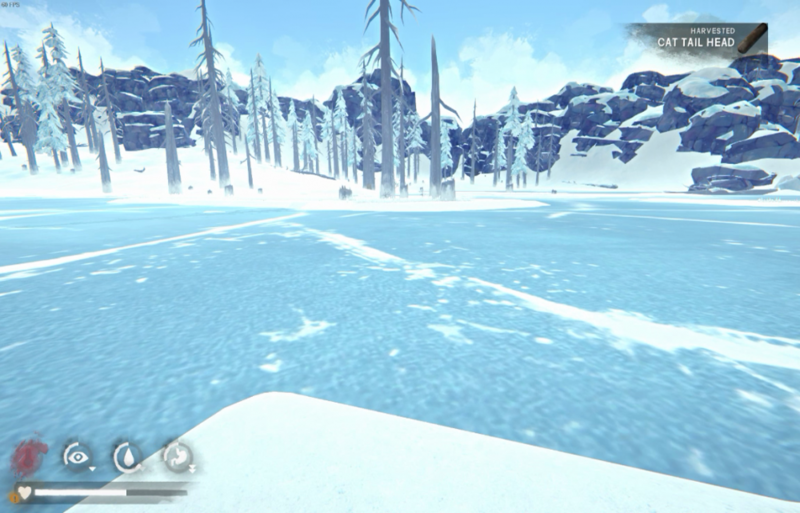 I've managed to fall through the ice in virtually every attempt I've tried to get to Spence's Homestead. On easier difficulties, I've managed to survive to get to land, build a snow shelter and warm up. Of course, no such luck on Loper. Before starting this challenge I knew on 1 sure fire way to get to the Homestead. *Spoiler* I am now on my 4th Keg Stand run and have found at least 3 or 4 guaranteed ways to the Homestead without falling through the ice. There is one path that I have found that is at most twice as wide as my shoulders and I have fallen through and survived on this run as I was already cold and went straight to sleep. 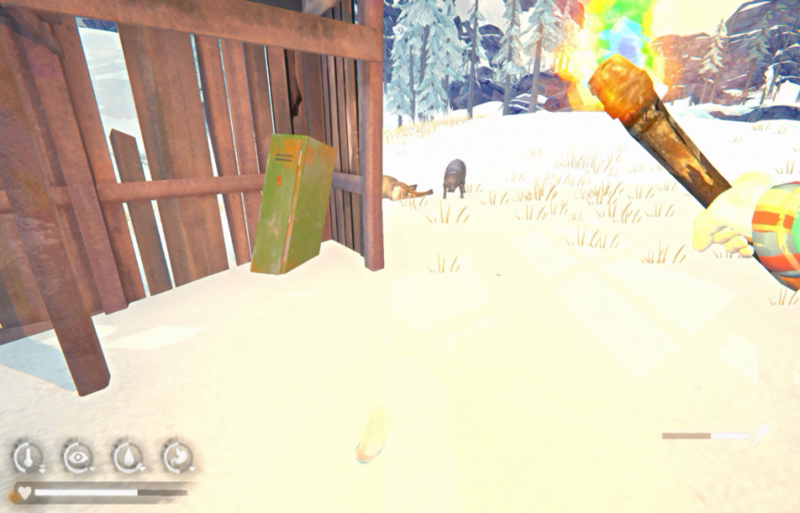 I'm not sure if falling through the ice de-aggro'd the bear as it was stalking me at the time. Success chasing off the wolf was not as clean as I would like it to be. 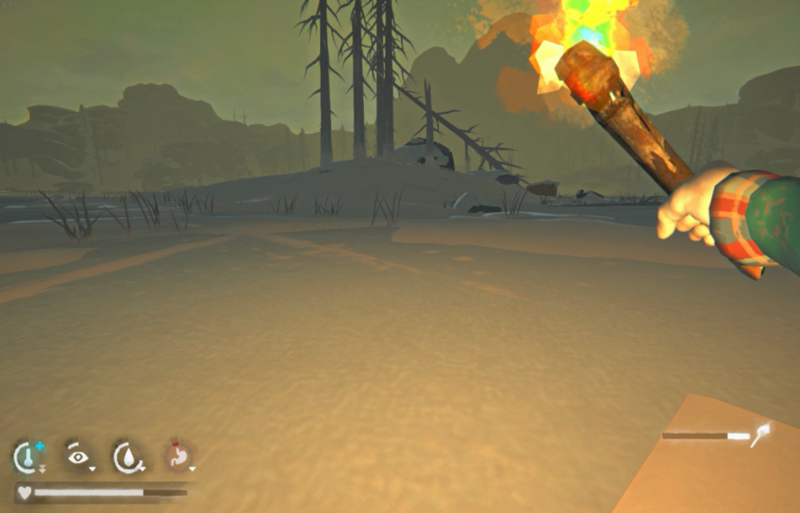 Grabbed a torch, wolf growled protecting it's kill and just as I was about to throw it charged. Luckily I retreated inside the invisible barrier of the barn and the wolf ran away yelping. Shamefully, I did not even hit the wolf with the torch but the prize was mine nonetheless. 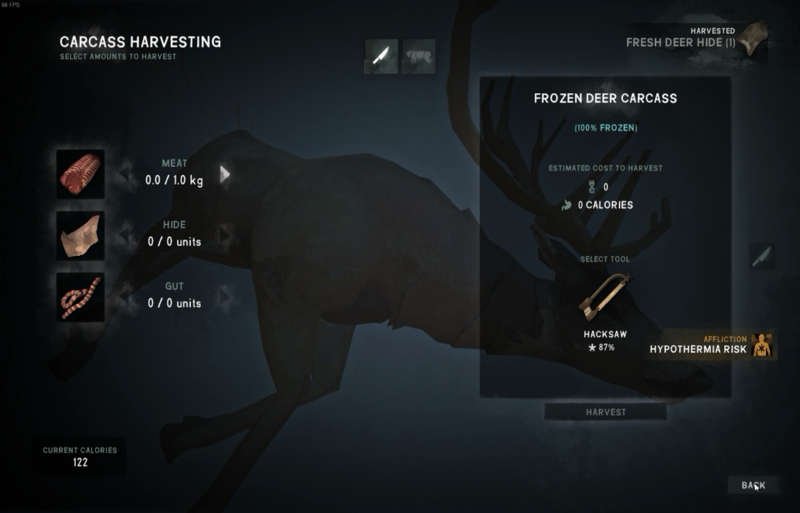 Jackpot, deer had 8.9kg of meat to harvest. On loper that will be like 12 days of food. I am set for what my short life might be out here. I will not go hungry in the 'keg. Not with the amount of reishi, hips and cattails. I always forget that real survival here is about long, long fires and this will occupy most of my waking hours. I harvest 1.5kg carefully dropping each portion on the ground before starting the next 0.5kg piece. Heat some tea and split the wolves to my left and right and head to the dock house for the combustibles there. I am only able to grab 2 out of 4 coal from the box and a wolf is on me. I sounds like it's behind me so the only way I have to go is away from safety and farther out on the dock. 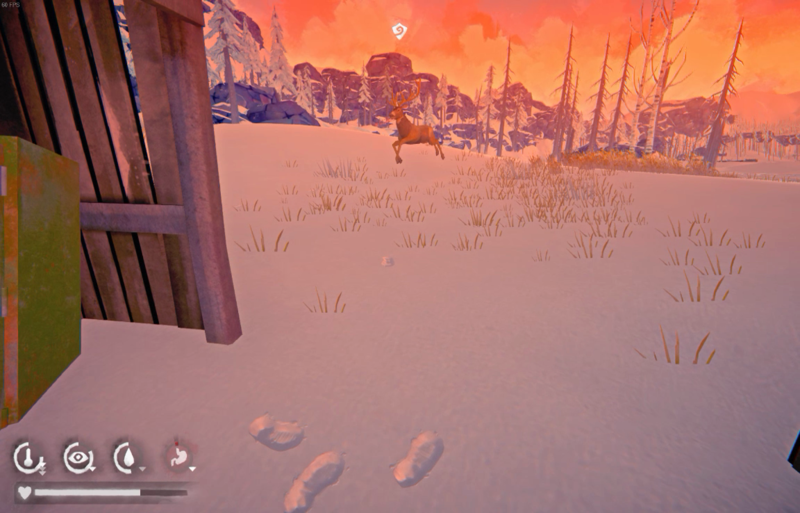 I pass the fire barrel with the wolf coming behind and as I round the corner I sprint to see if I can separate from the chaser. I cross my safe ice passage, notice a wolf a ways off to the left so I go right towards the stone arch. A decoy sure would be handy right now, no such luck. I've got a few seconds before imminent demise, I check the backpack. You did what? Yes, I did! The wolf is on me, charging again - it's time for fire. I back pedal and prepare my match and tinder. The wolf runs in the opposite direction and I have 10 matches left. I am just a few steps away from the High Blind, I collect cattails and find myself an arrow book, 0.48L of fuel and a hacksaw. I cross under the uprooted tree and look across a short stretch of blue ice (the bad kind). Safety on the other side is so close and then I could circle back around past the bunkhouses, I have never before used this route so the ice is unknown. It looks to be a sprintable width even so. I accelerate with held breath and...I cross. No weak ice. Another safe route discovered. Spoke too soon on the safe part as another wolf - how many are there!? - is patrolling the bunkhouse cave. She turn away and I circle around and get inside the cave for one up arrow (2*C). Frostbite 19% Hypo 24%. I need to get back to that fire, if it's still burning. How long has passed , I think there were 2+ hours when I left. I pass 1 hour in the cave and gain 1/4 on the temp meter. Back to the homestead stopping for reishi and sticks along the way. I miss the lantern completely but will be back later. 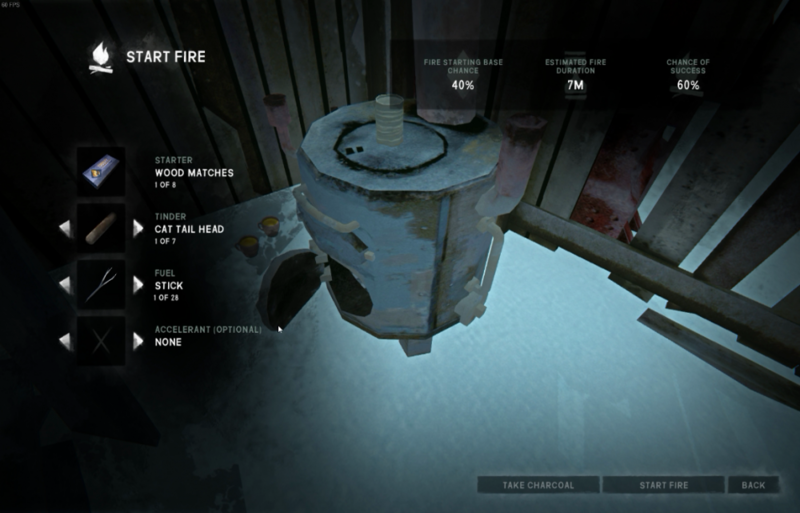 Furnace has gone cold and another match is used - 9 remain. I use the fuel for 100% chance. Fatigue is less than 10%. Time for sleep. All my sticks give me 8hrs of fire. I top it up with 2 cedar logs and 10.5 hours should be enough. I set 0.5L of water on, eat 2 out of my 30 cattails and sleep 1 hour to clear the hypo and frostbite. I need maximum healing on the 10 hours rest period. I harvest 2 guts from the deer kill while my steak dinner cooks on the furnace. One slot here is painfully slow, water is also in short supply. I eat my 2 steaks for 800 cal and top up water (1.1L left) and max out sleep for 10 blissful hours. Recovering from around 38% to maybe 65%. I awake, cold morning as usual. I peek my head outside the barn and get barked right back in. They have me pinned down all these wolves. I hear hooves at the same time. I get a front row seat to another battle for survival. It's ends quickly and mercifully. Farther away but maybe worth it to try for some more guts or hide to cure. If I can survive 5 days a pair of pants would go a long way. One last sprint up the hill, I hear the bark off behind me slightly to the right. I sprint the final steps into safety and setup my fire for the night. Torch walking has preserved at least 2 matches today. I awake around noon in 100% condition. It is -15C away from the warmth of the fire. 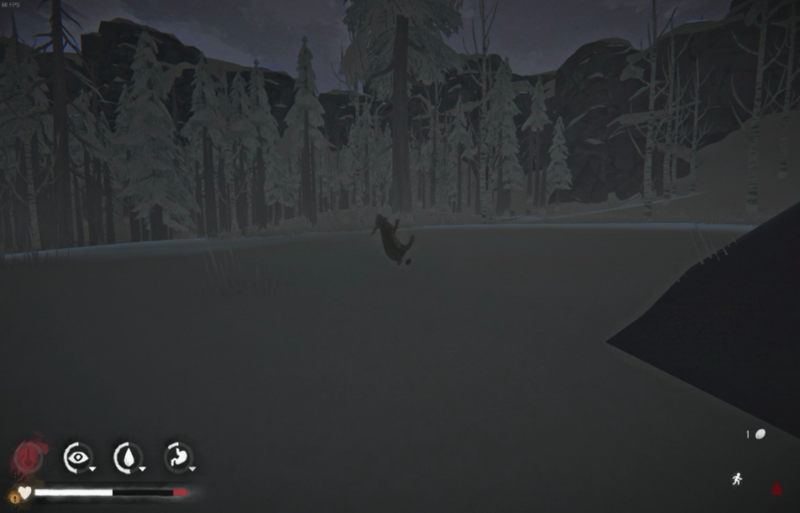 There is still a wolf patrolling by the open sheds. I circle around and up the hill to collect sticks to feed the flame. 3 dog food and some other supplies have glitched in the workbench drawer and I finally am able to free them from their prison. I have only 6 reclaimed wood and 5 coals plus a few sticks in my backpack. Gotta get some more firewood our I am going to freeze. It warms a bit and i take the last gut from the deer next to the barn. 6.9kg is still on the carcass but is not my first concern. I drink a hot tea and take off past the bunkhouse collecting sticks and reishi. 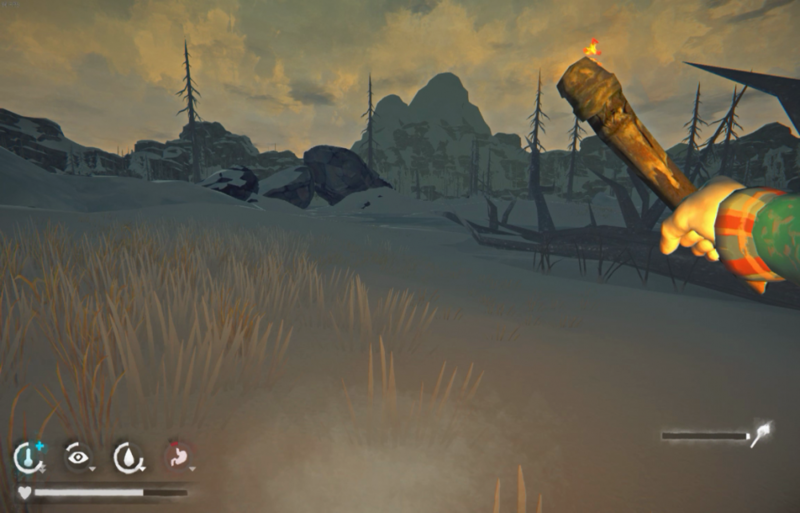 I pass the bunkhouse cave and continue to the southern cave (the second cave before the Muskeg Overlook) and find amazing loot of 7 coals there. 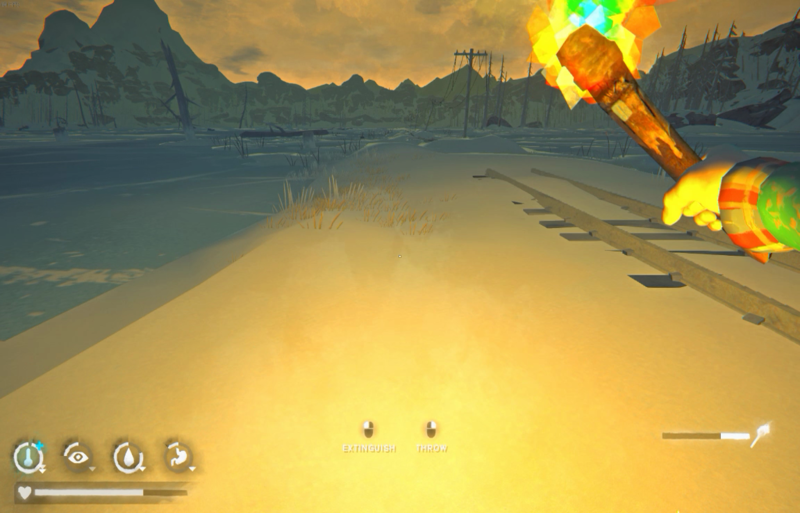 I have hypo 26% as I head back and restart the forge with a lit torch - gotta make sure with each and every match. After averting that peril I take another 1kg steak and cook it over the fire. I take most of the meat and the hide, gobble a 900 calorie steak and stoke the fire for bed. That quality of a hacksaw was a great score. 90%+ to start. Sleeping in till around noon is the way to go in FM. Always best to make use of the afternoon and early evening higher temps. I drink a hot tea and decide to shuttle my fresh guts and hide to the bunkhouse cave. The broken tower cave is closer but it is patrolled almost 100% of the time. With scent bar at 2 that is a no go zone. 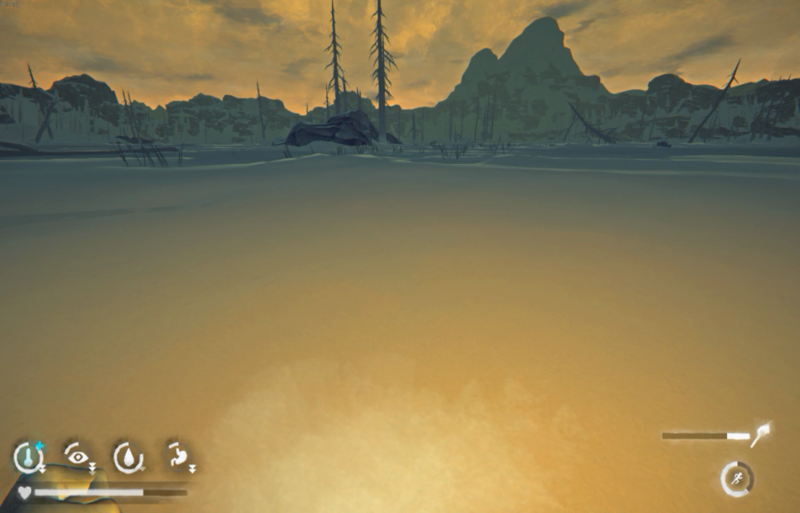 On the way to the other cave there can be a wolf on the muskeg but you can skirt around close to the hill if needed and just get by. If not abort and return to base. This time no wolf at the bunkhouses and the curing process has begun. 5 days and I can make a fish hook and line and repair my clothes if needed. Still need a lot more hides for any crafted clothing. I should have prioritized 3 or 4 rabbits ASAP on day 1 or 2. 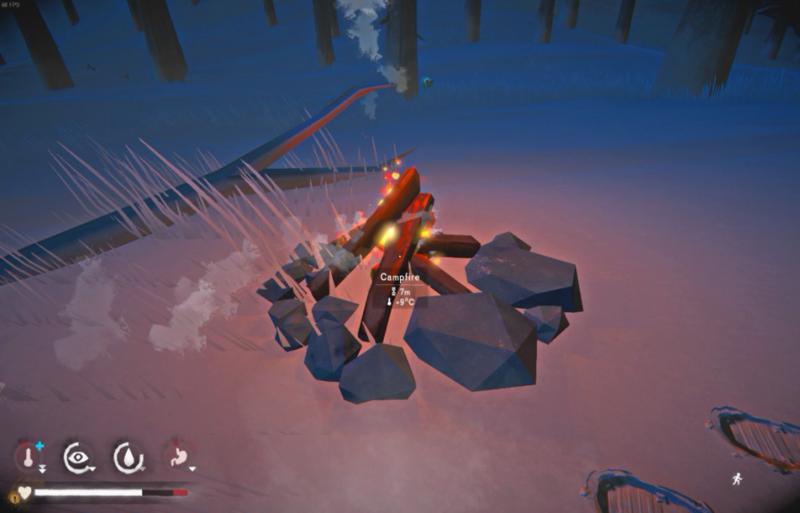 I get back from the cave and the teas by the fire are still hot but the fire is out, big mistake not checking the fire duration and adding just 1 or 2 more sticks costing a match. Temp is -5C so I hold off on the fire and see if i can pass time or sleep without heat. I manage to sleep 3 hours staying in the positive temp but after the 3rd hour I suddenly have 42% frostbite on my feet. That sure progressed fast. I check my sneakers and sure enough they are 100% frozen. I've never had frostbite this bad in any other interloper so I don't realize the danger I'm in from it. 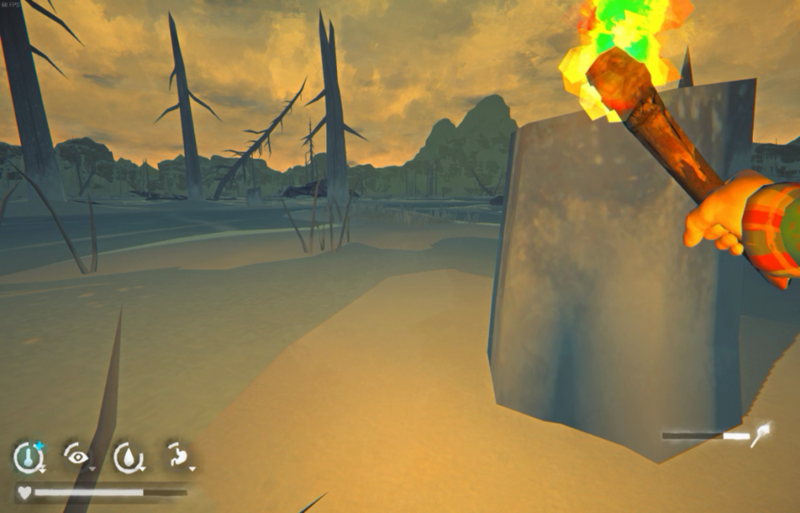 Deciding instead to delay starting the fire I go to the broken tower to collect wood. 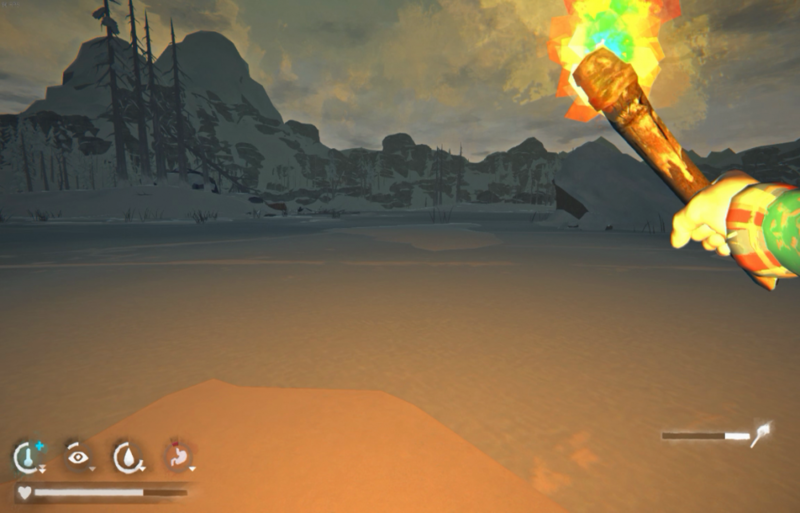 Making my way back I run into a wolf so I drop a fire beside a fir log and stoke it to 2 hours. I saw the wood and my aurora has begun. The wolf is keeping her distance from the fire and I decide to make a run at the next time she bounces off. I bolt down the hill right into another set of glowing green eyes. Two wolves!!! My path is block so I grab a torch from my still burning fire a prepare a second fire to chase this one off. Just as it lights and I add a half dozen sticks the wind comes up and I lose an hour of fire down to 9 minutes. I just have to get back now, forget sawing more wood, this is dire. She bounces off the fire one last time and I sprint past the rocks and down the gully to the homestead. What a hair raising way to end the day. I break down boxes and shrubs until morning before upping the fire to 9 hours and going to sleep. Like a stubborn old fool (which I am), I keep trying to find a path around the edge from the Broken Railroad entrance and wide up getting squeezed out onto the ice to get around a particular boulder a short distance before getting to the homestead. 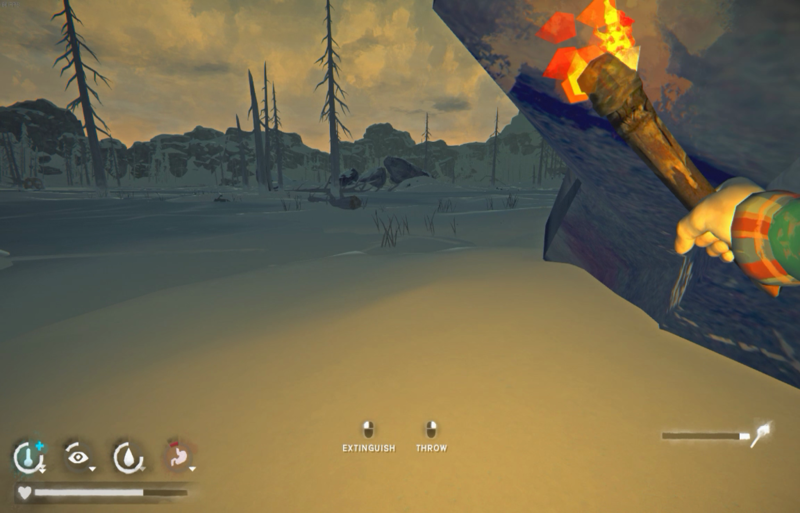 I've only successfully made it once without falling in... and on that run I found a campfire with a corse and a rifle somewhere in that vicinity. Needless to say, I haven't found that encampment again either. I think there must be a higher path and a way around that boulder that I'm just not seeing. I don't see you survive for too long staying at the Homestead because it consumes a lot of non-renewable fuel. 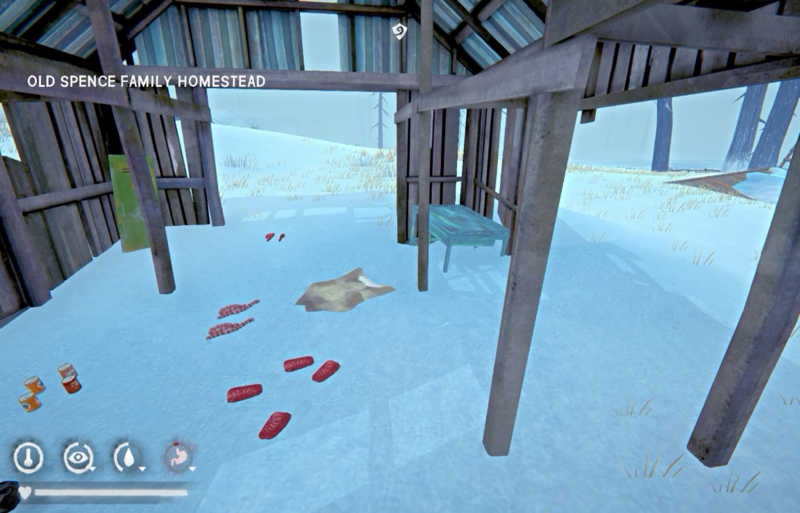 This is clearly the best to way to start (for matches, loot, bed), but if I were you and since you now have the needed cloth, after I collected as many pelts and guts as possible, I'd go live near Marsh Ridge in a shelter. That's a long way, but there's no choice imo, you'll need an indoor sooner or later, and you won't find a bedroll. My plan, long term, with the Skaters, was to live there, on snares, since there's also tons of fuel nearby. I will post the route from Broken Railroad to the Homestead later today - actually there are 2 of them. Along the edge of the ice is death. My guaranteed way is up the cliff and over the double tree bridge to the broken tower. The second route is across bear island and the narrow ice crossing. Interesting idea. It's true the non-renewable fuel is a challenge and I am finding it barely manageable to keep the fire going but how much cloth am I willing to sacrifice in clothes is another question. 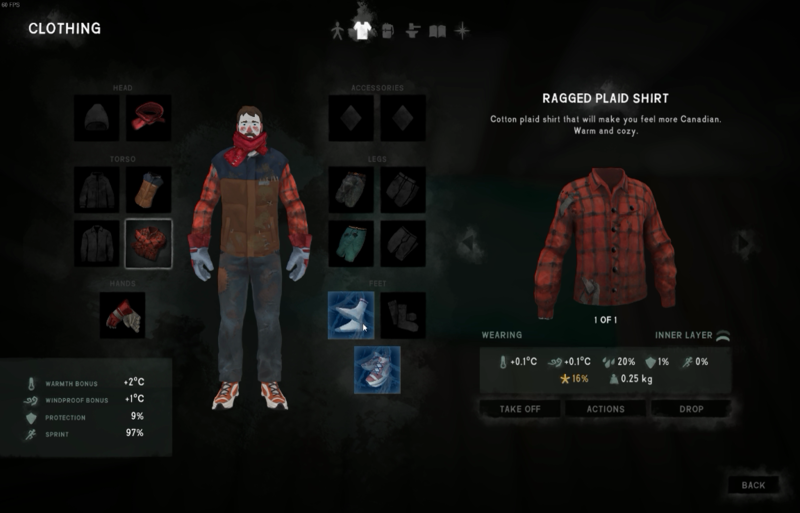 Shelter is 5 cloth and that would mean nearly every piece but one of my clothes. 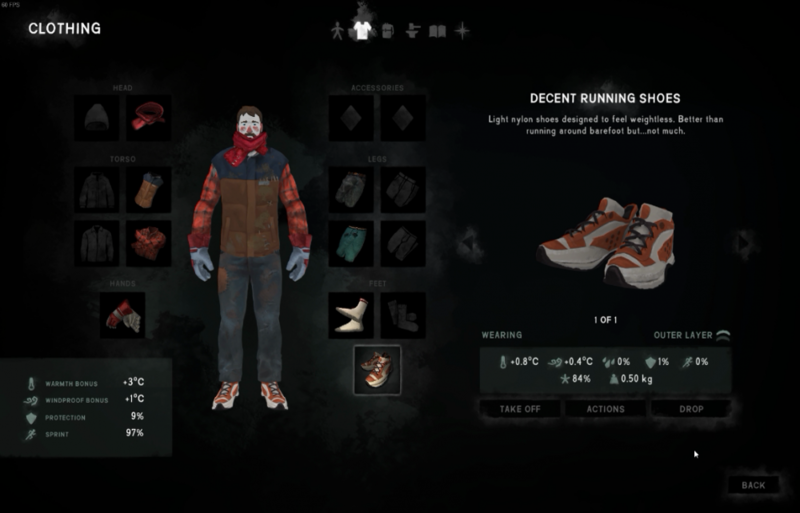 If I could get deer pants and boots going then this might be possible. Also would need rabbit mitts and hat. I also understand that this is a 1 in 4 spawn chance for a mag lens on interloper so maybe that would be the ticket to longer survival. I have never found one in about 10 spawns so far (not just this challenge). I am finding myself very fortunate so far as far as weather and blizzards go. Maybe FM does not have such severe weather as TWM and the snowballs encountered. What's up, got your PM and came to check the thread. As you can tell, I did try survival at FM only. After spending 100 days in that region a long time ago, I was feeling confident. It's perfectly doable but heavily dependent on strategy and crucially RNG. I still have the 13 days survived save but I stopped playing him completely. Getting matches at high blind is crucial if you want to set any records there, I did not. That and the fact that you have to prepare, use and abuse snares to sustain yourself after the cattails feast starts to get thin. I'm liking your attempts so far, but I'll echo BareSkin's comments on Spence's. It's impossible to survive here long term since you will need a fire non-stop. 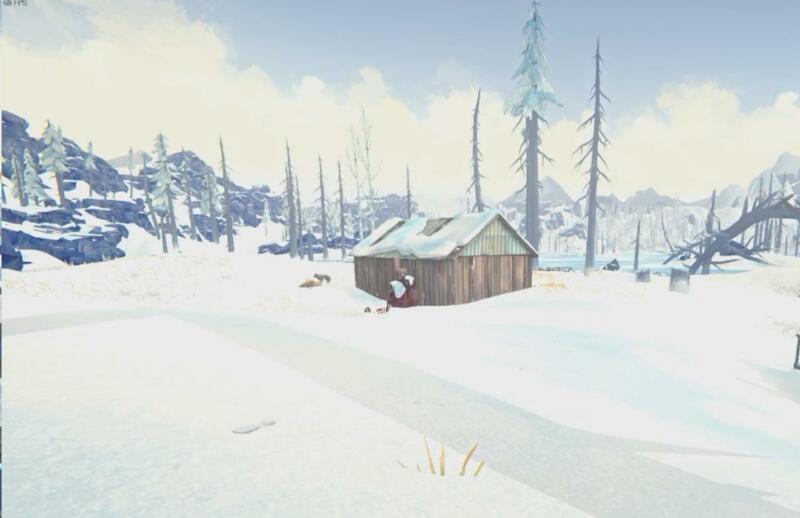 I stayed mostly at Marsh Ridge, you have the warm inside cave to hide when the blizzards get way too tough and there's a good spot for a snow shelter by the stim cave where you can build a decently protected fire to sleep in a pinch. A good fuel saving strat is to wait out the cold morning inside the cave and then sleep after the day starts to get warm. You can then go out and explore in the afternoon and on early nights, just mind the wolves. The fog also tends to occur by late afternoon, so it's a really good strategy. Another slightly perverse mechanic many people do not take into account is snow shelter decay, if you go away for a crafting voyage ( I did for snares ), you will need cloth to repair your snow shelter since you just can't come back fast through the cold and night, so stock it up before settling up at the ridge. 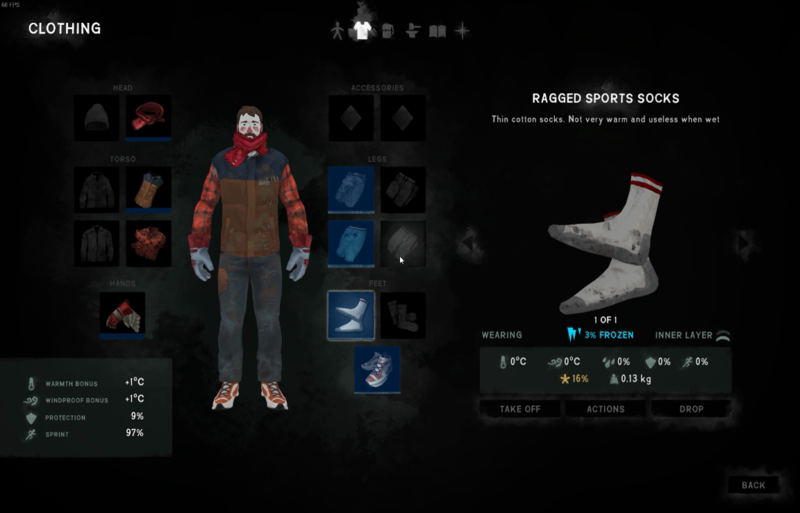 There's always a sports vest by the Muskeg Overlook and you need to check the abandoned campsites for those extra food and cloth you get from dismantling the snow shelters. Also, I'm intrigued to see if throwing stones to scare charging wolves actually works, I've seen a video but I did not try it yet. It would be a game changer since wolf zones are pretty much no go without a torch. Finding another set of matches would be nice, finding a Maglens would even get you past the first month. 1/ Whatever spawn, rush the Spence for the matches. 3/ once nearby carcassing processing is over (24h? ), get enough cloth to go build the Shelter. The cave will have a rope for shortcutting next time. 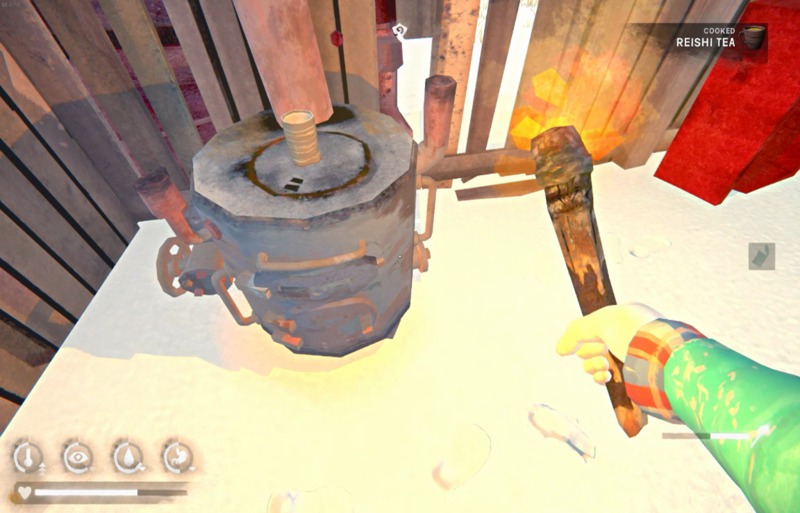 4/ grab the coal in mine, and stockpile nearby fuel+ cure more rabbit in the cave. It works, but I wouldn't bet my life on it, it's really out of desperation given the probability of the hit "connecting"
Well then, we just found some cool stuff to practice, don't we? I'm going to fire up the game this weekend and test if you can hit consistently, a few new interloper lives will be sacrificed to science once again. Broken Railroad to Spence by the upper route. You might end up finding a shorter version, that maybe might involve a bit a sprinting, since I always end up arriving at Spence from the group of burnt houses to avoid this very wolfy Spence front approach. Agreed, there are certainly other routes. My goal in showing this route was for zero sprinting and all safe ice as there have been many times I've returned completely exhausted to Spence's and could not run if I tried. 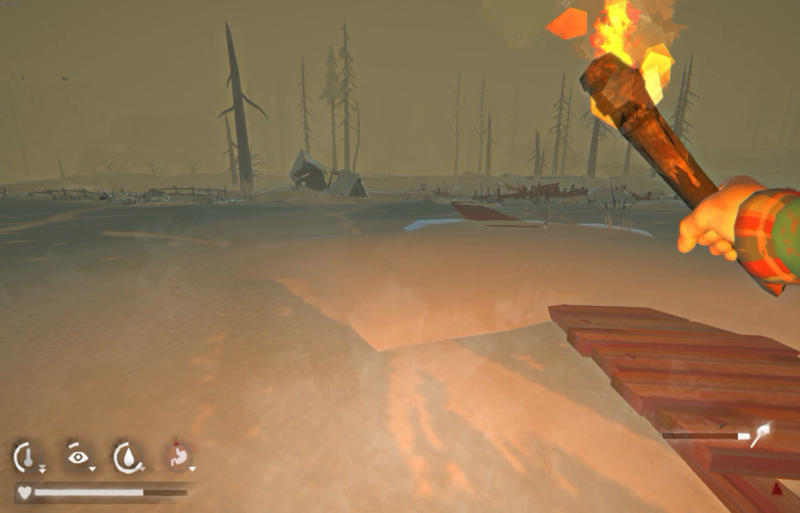 I find the wolves aren't bad if you shuffle left of the dock down by the water before you go up the hill and across the fence to the forge. Even when the 3 wolves are around the forge there are a few safe paths into the barn. Spence to Broken Railroad along the ice. I begin the day looking at my clothing. Not looking good. Jeans 18%, plaid shirt 14%, wool scarf 22%, socks 17%. After waking up to -6C a blizzard has come up and it feels like -22C. I make my way to Waterfall Cave to ride out the cold as my fire has gone out. 8 coal and several sticks and branches to breakdown is a good haul. Problem is my frozen clothing is not thawing out. I exit with just 20% on my temp bar and take out all 4 rabbits on Marsh Ridge. I harvest all 4 guts and 4 hides and drop on the cave floor to cure. I load up with my sticks and exit the waterfall end hoping to find a can opener at the shortwave tower. No such luck, I only find a bandage and accelerant. 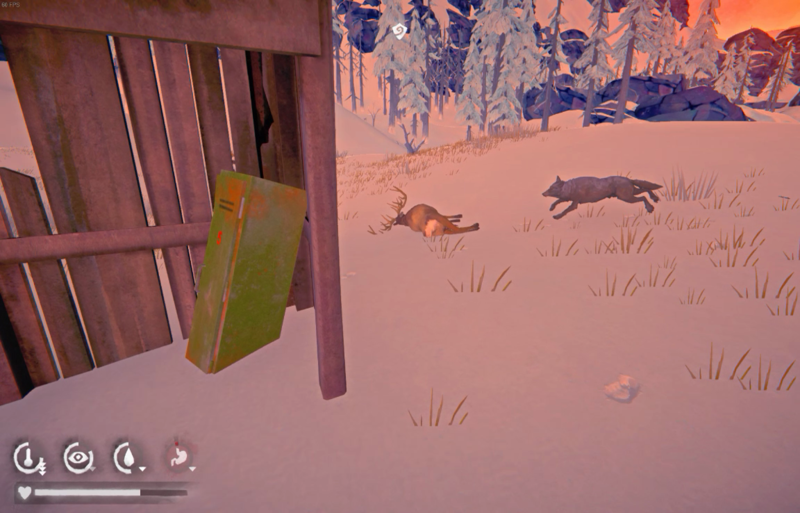 One of these is not that useful as any wolf struggle is probably the end of our survivor. It's know extremely cold the next morning and I am nearly exhausted walking back to Spence's. We are going to take a significant condition loss getting back. 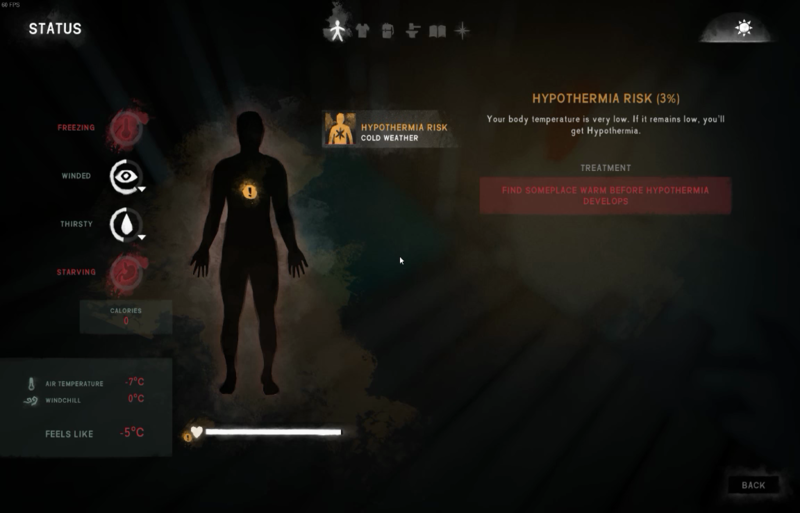 Back to camp at maybe 12% health or so. Probably could have planned that trip a bit better as we walked there in the cold and came back in the cold as well.I sleep 2 hours to get rid of hypo then stoke the fire for a 10 hour rest to maximize health gain. I am also out of water so I have to go a 3rd hour just to make another 0.5L. I head to bed around noon wasting the warmer part of the day asleep while also minimizing the length of my fire too.